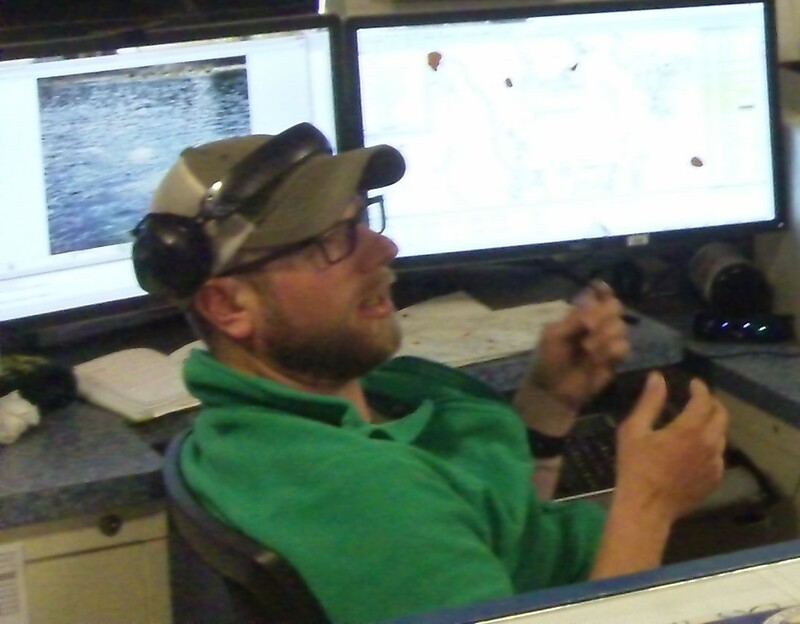 Hydrographic Senior Survey Technician Clint Marcus is cataloguing all of the discreet hazards and objects by location and by photographic evidence that will be available for the new nautical charts once the survey is complete. 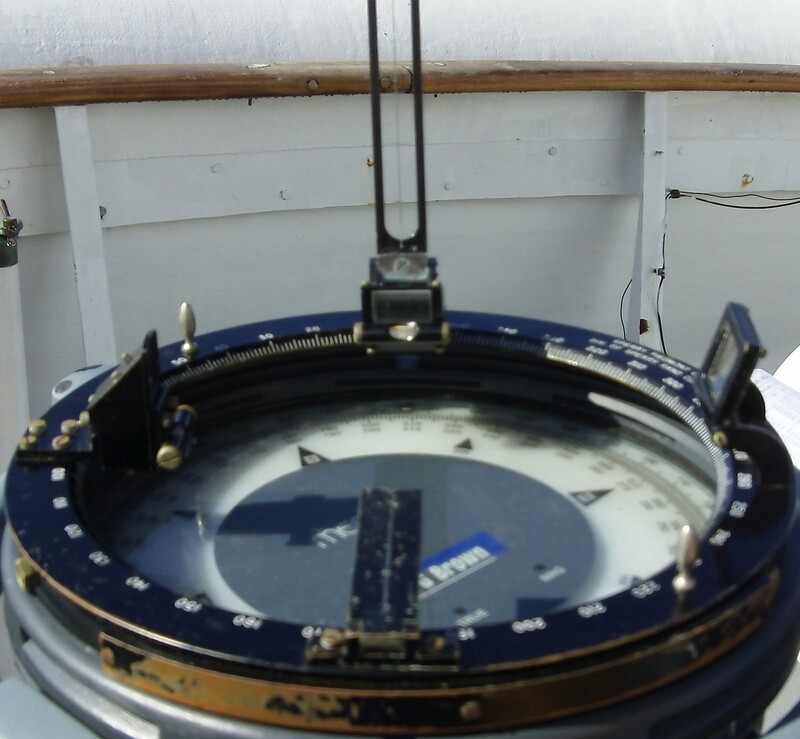 Uncovering potential dangers to navigation often requires more that acoustic equipment to adequately document the hazard. Many hazards are in water that is shallow enough to potentially damage equipment if a boat were to be operating in that area and may also require special description to provide guidance for those trying to interpret the hazard through nautical charts and changing tides. This is one of the key reasons so much planning must be placed into assigning survey areas determining the size and extent of polygons for mapping. Depending on the complexity of the area’s structures, the polygon assignment will be adjusted to reasonably reflect what can be accomplished in one day by a single launch. Near-shore objects may require a smaller boat to adequately access the shallow water to move in among multiple hazards. This is where a smaller boat like the Fairweather’s skiff can play a role. The skiff can be sent out to map where these near-shore hazards are using equipment that that will mark the object with a GPS coordinate to provide its location. Additionally, a photograph of the hazard is taken in order to provide a greater reference to the extent of the object and what it looks like above or below the water. This information is collected and catalogued; so, the resulting nautical chart will have detailed resources and references to existing nautical hazards. Ensign Pat Debroisse covers nautical hazards such as rocks and kelp indicated throughout a very shallow and hazardous inlet. 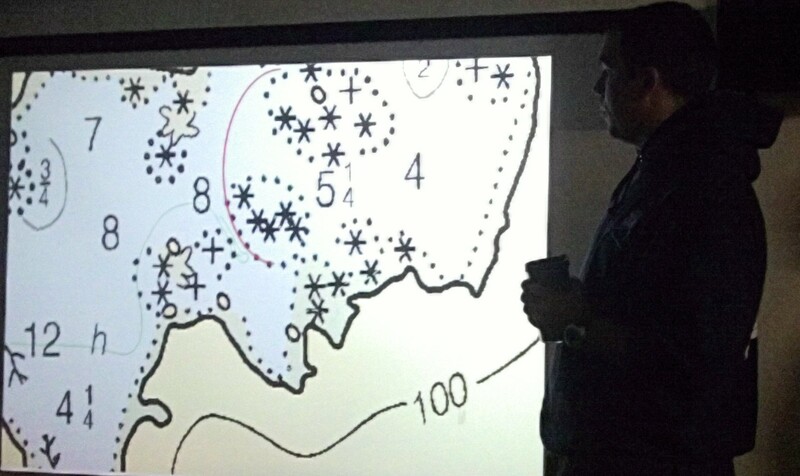 Nautical hazards are not the only feature found on charts. Nautical charts also have a description of the ocean bottom at various points throughout the charts. These points may indicate a rocky bottom or a bottom consisting of silt, sand, or mud. This information can be important for local traffic in terms of boating and anchoring and other issues. In order to collect samples from the bottom, a launch boat drops a diving probe that consists of a steel trap door that collects and holds a specimen in a canister that can be brought up to the boat. Once the sample is brought up to the boat, it is analyzed for rock size and texture along with other components such as shell material in order to assign a designation. This information is collected and catalogued so that the resulting nautical chart update will include all of the detailed information for all nautical hazards within the survey area. 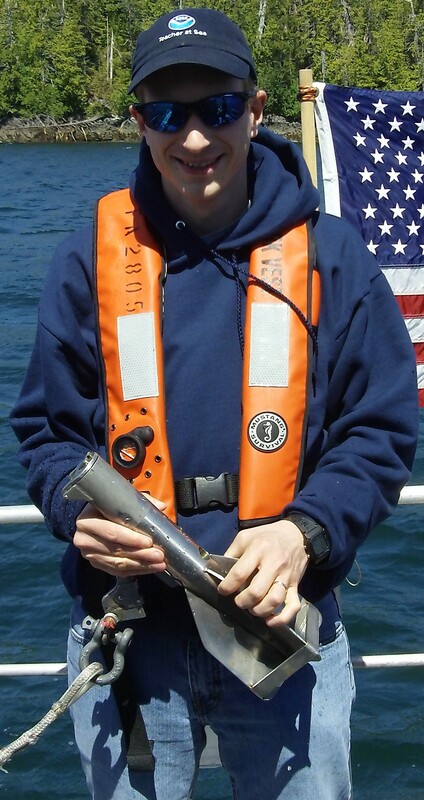 Bottom samples are taken with a heavy steel torpedo-shaped probe that is designed to sink quickly, dive into the ocean bottom, clamp shut, and return a sample to the boat. Credit Ensign Joseph Brinkley for the photo. The food onboard the Fairweather is also very good. Much of the work that they do happens so early in the morning that most never see it take place. Our stewards take very good care of us by providing three meals a day, snacks, and grab bag lunches for all of our launches each day. They need to start early in morning in order to get all of the bagged lunches for the launches prepared for leaving later that morning and breakfast. They start preparing sandwiches and soup for the launches at 5 AM and need to have breakfast ready by 7 AM; so, mornings are very busy for them. A morning snack is often prepared shortly after breakfast for those on break followed by lunch and then an afternoon snack and finally dinner. That is a lot of preparation, tear down, and clean up, and it all starts over the next day. The steward department has a lot of experience in food preparation aiding them in meeting the daily demands of their careers while preparing delicious and nutritious food that the crew will enjoy. What are you doing at 5:15 in the morning? Mornings are very busy for the steward department preparing lunches for the day’s hydrographic launches and breakfast for the entire crew. From left to right, Chief Steward Frank Ford, Chief Cook Ace Burke, Second Cook Arlene Beahm, and Chief Cook Tyrone Baker. Chief Steward Frank Ford is preparing a delicious mid-morning snack for the crew. Frank Ford is the chief steward. He has been in NOAA for six years. Before joining NOAA he had attended culinary school and worked in food service for 30 years in the restaurant and hotel industry. 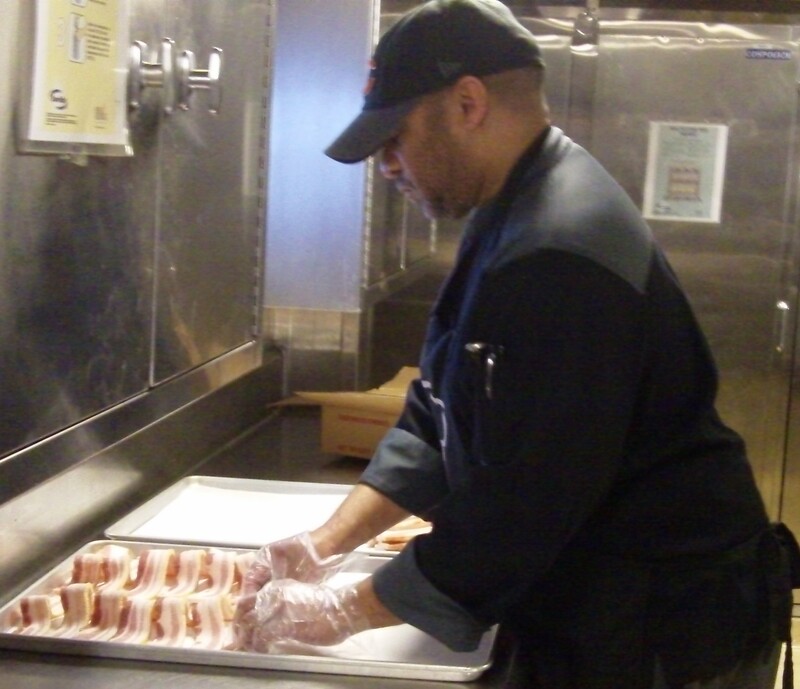 “I try to make meals that can remind everyone of a positive memory…comfort food,” Frank goes on to say, “Having good meals is part of having good morale on a ship.” Frank and the others in the steward department must be flexible in the menu depending on produce availability onboard and available food stores as the mission progresses. 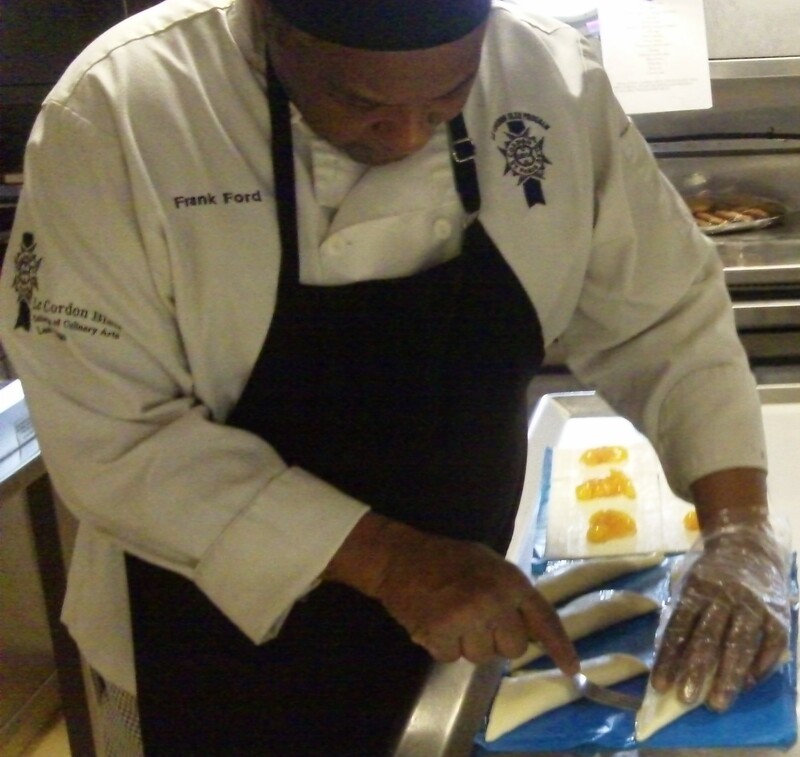 Chief Cook Tyrone Baker helps prepare breakfast. Tyrone Baker is the chief cook onboard. He has been in NOAA for 10 years and has 20 years of food service experience in the Navy. Ace Burke has been with NOAA since 1991 and has served in many positions in deck and engineering and has been a steward for the last 15 years. He came over from the NOAA ship Thomas Jefferson to help the steward department as a chief cook. Arlene Beahm attended chefs school in New Orleans. She has been with NOAA for 1 ½ years and started out as a general vessel assistant onboard the Fairweather and is now a second cook. Relying on GPS to know where a point is in the survey area is not accurate enough. It can be off by as much as 1/10 of a meter. In order to increase the accuracy of where all the points charted on the new map, the Fairweather carries horizontal control base stations onboard. These base stations are set up on a fixed known location and are used to compare to the GPS coordinate points. Utilizing such stations improves the accuracy of all points with the survey from 1/10 of a meter of uncertainty to 1/100 of a meter or a centimeter.